Our tools can increase the performance of your external, customer-facing website, smoothly connecting your office and supply center with your customers, whether they are vendors, distributors or end-users. Many manufacturers use various mini-sites for different purposes, Adrecom's content management solution for manufacturing helps you to maintain a consistent web presence with unified branding across all your online properties. Manufacturers have a host of special needs that are not automatically meet by conventional web developers. Manufacturers have a host of special needs that are not automatically met by conventional web developers. 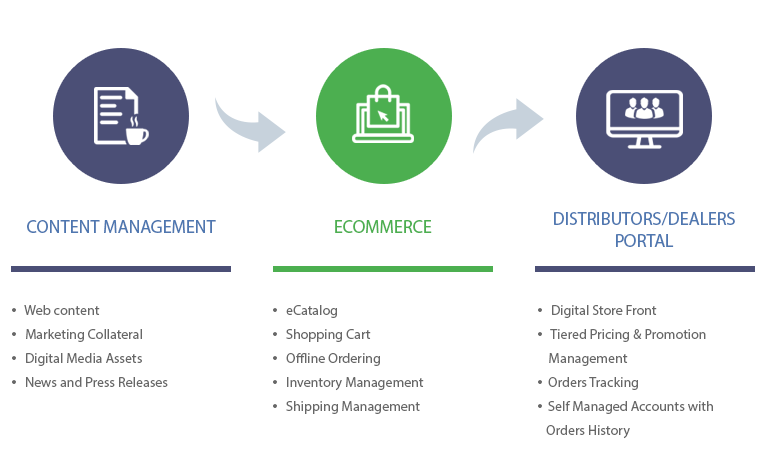 Rather than traditional consumer-focused e-commerce sites, manufacturers need e-commerce sites that address specific B2B needs, allowing them to automate distribution and sale process over multiple sale channels. Adrecom's B2B e-commerce solutions can automate sales processes, thus reducing your operating costs. By facilitating the creation of custom online product catalogs and landing pages, our tools give you the power to appropriately market you products and increase sales overall. Significantly, we allow you to do this in a manner that integrates perfectly with your distributors' programs, thus avoiding inadvertent competition.